Since your blood vessels are the pathways that transport oxygen and nutrients throughout your body, it helps to keep those pathways strong. This new-ish supplement promises to do just that. These days, there's no shortage of performance-enhancing supplements to choose from. Nitrosigine® is one the newer kids on the block, and has quickly made a name for itself as a powerful way to improve performance. It's one supplement worth getting to know when you want to take your workout to the next level. Nitrosigine is a patented compound composed of arginine and silicon, otherwise called an arginine silicate salt, that includes potassium and uses the naturally occurring sugar alcohol, myo-inositol, as a drying agent to stabilize and deliver the primary active ingredient. Combining the two key substances allows more of both to be absorbed into the bloodstream, making them available to your working muscles and tissues. Arginine is an amino acid the body uses to produce nitric oxide (NO), which helps to dilate blood vessels and increase blood flow. Silicon is a trace mineral present throughout plant-based foods and is most known for its vital role in skin and connective tissue. However, this versatile mineral also helps protect and enhance the integrity of blood vessel walls, which further aides healthy blood flow. What are the benefits of nitrosigine? Specifically, Nitrosigine increases blood flow by stimulating the production of NO and dilating your blood vessels (vasodilation). During exercise, more blood flow means greater oxygen and nutrient delivery to, and removal of metabolic byproducts from, working muscles. This allows you to work out at a higher intensity for longer periods of time with less fatigue. In the long term, this can lead to greater muscle growth. In the short term, it can give you more energy and one hell of a pump. The other benefit comes after a workout. Nitrosigine has been shown to reduce creatine kinase (a marker of muscle damage) levels after exercise by 44 percent. Reducing muscle damage can help you get back to the gym faster and stay in the game longer. Furthermore, Nitrosigine has been shown to increase mental acuity and focus by as much as 35 percent. It's best to take Nitrosigine 15-30 minutes before your workout. Since it's typically found in pre-workout supplements, mix it with water and drink it before—or as—you head to the gym. Nitrosigine increases blood concentrations of arginine and silicon for at least one and a half hours after you drink it the first time, and up to 6 hours after using the product for a couple of weeks. Unless you have a 90-minute drive to your gym, it should last through your typical workout. The studies that have reported significant benefits from using Nitrosigine have used 1,500 milligrams per day, which equates to 600 milligrams of arginine and 120 milligrams of silicon. Unlike creatine, you don't need to load with Nitrosigine to derive benefits. Continued use can further increase the amount of nitric oxide, silicon, and arginine levels in your blood to promote dilation of your arteries and keep your blood flow full and strong. 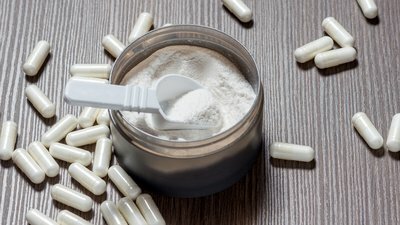 How does it play with other supplements? The widespread use of, and the prior research on, the combination of arginine or silicon within formulations suggests Nitrosigine can be stacked with other supplements. Since it's commonly found in pre-workouts, Nitrosigine is often found with other ingredients such as caffeine, citrulline malate, and beta-alanine. It's also within post-workout formulas, in-between-meals whey protein supplements, and men's formulas in combination with tribulus, zinc, and/or eurycoma. Current research doesn't indicate any negative side effects from taking 750-1,500 milligrams of Nitrosigine per day. Before you start any new diet or supplement protocol, though, always check with your primary care physician. Because Nitrosigine increases NO production and dilates blood vessels, it may lead to low blood pressure in some users. Because certain prescription medications also lower blood pressure—including but not limited to meds for high blood pressure—make sure your doctor knows everything you're taking: supplements and medications. The cumulative effects of multiple blood-pressure-lowering agents can be profound—and dangerous. Komorowski, J., & Ojalvo, S. P. (2016). A pharmacokinetic evaluation of the duration of effect of inositol-stabilized arginine silicate and arginine hydrochloride in healthy adult males. The FASEB Journal, 30(1 Supplement), 690.17. Rood-Ojalvo, S., Sandler, D., Veledar, E., & Komorowski, J. (2015). The benefits of inositol-stabilized arginine silicate as a workout ingredient. Journal of the International Society of Sports Nutrition, 12(Suppl 1), P14. Kalman, D., Harvey, P. D., Perez Ojalvo, S., & Komorowski, J. (2016). Randomized prospective double-blind studies to evaluate the cognitive effects of inositol-stabilized arginine silicate in healthy physically active adults. Nutrients, 8(11), 736.